I’ve been having so much fun with my DIY chalk board that we made a couple months ago. I just thought I’d show you the fun way we’re using it now, and give you some ideas for a Spring chalkboard idea in your home! I originally wanted the chalkboard for my kitchen because I wanted to have a place to list the things I had planned on making for dinner each week. I have this bad habit of buying all the ingredients for delicious meals, and then forgetting what I was going to make. We have a lot of busy nights, and I’ve found, that if I have a plan then we usually stick to it. So far, so good. We mixed the days up and had spaghetti squash with meatballs last night, instead of Tuesday. But, at least I’m sticking with the meal plan! I also love putting our big events on the calendar so I don’t double book my kids. I have lots of calendars around the house though, so I just put the main dates on this one for a constant visual reminder, since I see this all day. It was a little too much fun to make this, and a bit therapeutic to color on it. I might have to make one for my kids, since I really don’t want to share this one! I would love this in my home! 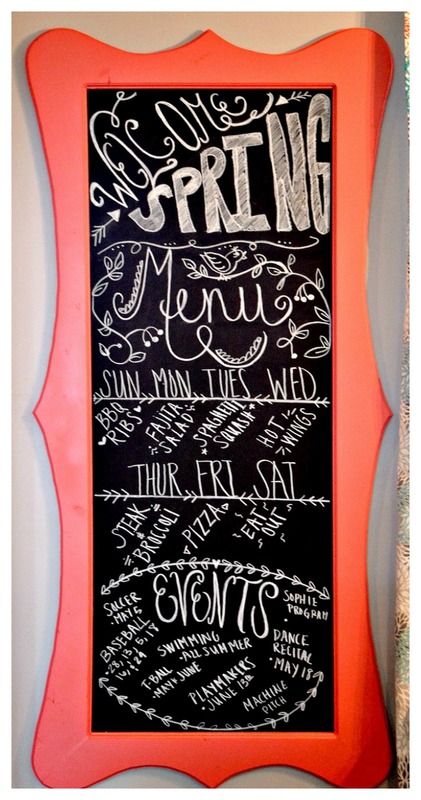 Thank you so much for sharing this delightful Spring Chalkboard with us on the Plant-Based Potluck Party Link Up. I'm pinning and sharing.